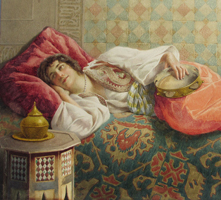 Francesco Ballesio (Italian, 1860-1923) A fine orientalist pencil and watercolor heightened with gum Arabic on paper figure of "A Middle-Eastern Beauty at Rest" depicting a young maiden resting on a Persian rug laid down as a bed while holding a tambourine and next to a Moroccan ivory-inlaid octagonal table with a tea pot on top. Signed and inscribed 'Ballesio Roma Tivoli' (upper right). 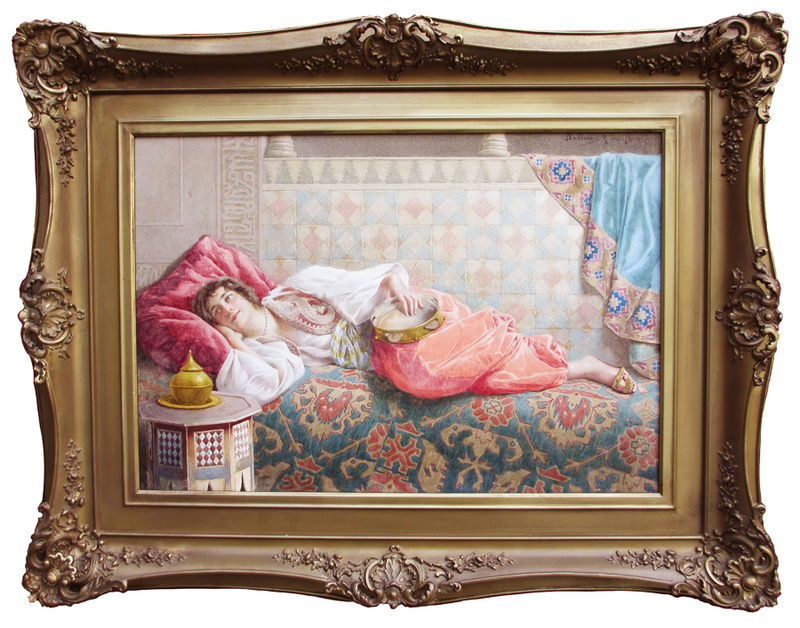 All within an ornate rococo gilt wood and gesso carved frame with a protective glass. Circa: Rome, 1890-1900. 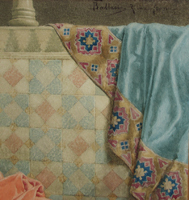 A similar subject matter watercolor is catalogued and illustrated in Caroline Juler, "Les Orientalistes de l'école italienne", vol. 5, Courbevoie, 1987, page 25. Sotheby's New York, Sale N08406 on 26 January 2008, Lot 225 "Pottery for Sale" Sold for $28,000 USD. 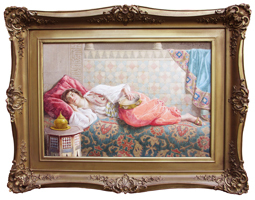 Sotheby's London, Sale L08101 on 30 May 2008, Lot 127 "Odalisque" Sold for £24,500 ($39,445 USD). 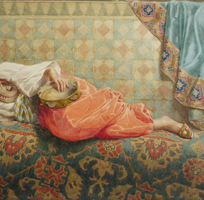 Sotheby's New York, Sale N08235 on 24 October 2006, Lot 20 "A Reflection of Harem Beauty" Sold for $31,200 USD. 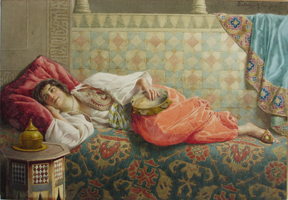 Sotheby's London, Sale L13101 on 5 May 2013, Lot 278 "The Carpet Merchant" Sold for £15,000 ($23,850 USD).